Time and again we read that white children are not taught about race and racial injustice with the same frequency or at the same early age as their peers of color. Parents of white children often struggle to work conversations about race "naturally" into the flow of the day, believing that race, like sexuality or body development is a topic that necessitates a "big talk" in a time carved out from the flow of normal life. One of the easiest ways to do this is to have books around that prompt conversation and answer questions. Reading "diverse" books and cross-culturally is a great place to start. We also believe that one of the best ways to raise healthy, race-concious white children is to talk to them early and often about racial injustice and racial difference in the course of your daily family life. We recommend the following books for all families, but especially for parents of white children who may be struggling to talk about racial injustice with their kids and teens. We intentionally only featured a handful of "history" books and did not include the many wonderful biographies and histories of movement leaders because, though we carry those books in our store, too often discussions of racial justice and racism focus on the past, on the Civil Rights Movement in isolation or on individual heroes. Change begins now, with white people, in this present moment. We hope this gives you a few ideas for starting places. As always, we encourage you to browse our store in person at 1189 Euclid Ave. NE Atlanta, GA 30307 or buy online at www.charisbooksandmore.com. Not My Idea: A Book About Whiteness is a a picture book that invites white children and parents to become curious about racism, accept that it's real, and cultivate justice. 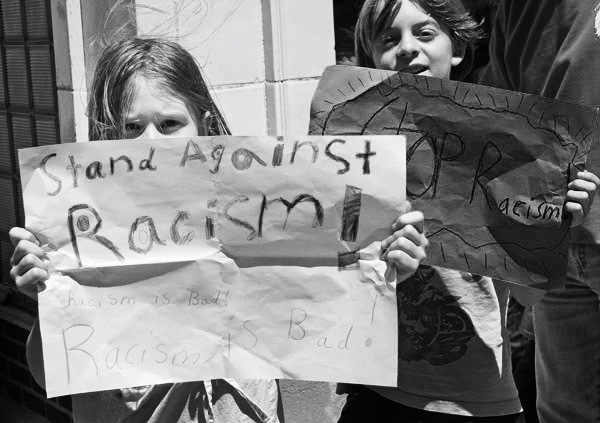 Racial discrimination is cruel--and especially so to younger children. This title encourages kids to accept and be comfortable with differences of skin color and other racial characteristics among their friends and in themselves. A First Look At... is an easy-to-understand series of books for younger children. A little mouse innocently plucks a flower from an old wall when a brick comes loose, and he can see through it for the first time. He and the other animals gradually and resolutely remove more and more bricks, until at last they can see another group of animals. With the ease and simplicity of a nursery rhyme, this lively story delivers an important message of social acceptance to young readers. Themes associated with child development and social harmony, such as friendship, acceptance, self-esteem, and diversity are promoted in simple and straightforward prose. Cocoa, tan, rose, and almond—people come in lots of shades, even in the same family. Grace loves stories, whether they're from books, movies, or the kind her grandmother tells. So when she gets a chance to play a part in Peter Pan, she knows exactly who she wants to be. Remarkable watercolor illustrations give full expression to Grace's high-flying imagination. New York Times best-selling author Robie H. Harris helps preschoolers understand what makes us who we are — from our height to our hair, from the shade of our skin to our eyesight. Now in a mini edition! The Universal Declaration of Human Rights was signed on 10th December 1948. It was compiled after World War Two to declare and protect the rights of all people from all countries. Toni Morrison has collected a treasure chest of archival photographs that depict the historical events surrounding school desegregation. These unforgettable images serve as the inspiration for Ms. Morrison’s text—a fictional account of the dialogue and emotions of the children who lived during the era of “separate but equal” schooling. Helping Teens Stop Violence, Build Community, and Stand for Justice is a guide for adults who work with young people ages ten and up on issues related to youth leadership and social justice. It is also a training manual for adults who want to become effective allies to young people and develop the skills needed so that they can facilitate community building among youth. Black Lives Matter covers the shootings that touched off passionate protests, the work of activists to bring about a more just legal system, and the tensions in US society that these events have brought to light. Aligned to Common Core Standards and correlated to state standards. Essential Library is an imprint of Abdo Publishing, a division of ABDO. No Choirboy takes readers inside America's prisons and allows inmates sentenced to death as teenagers to speak for themselves. In their own voices—raw and uncensored—they talk about their lives in prison and share their thoughts and feelings about how they ended up there. An incredible, informative, collection of essays, articles, analysis, interviews, primary documents and interactive & interdisciplinary teaching aids on civil rights, movement building, and what it means for all of the inhabitants of the planet. Using humor as the common denominator, a multicultural cast of YA authors steps up to the mic to share stories touching on race. Emma and Josh heard that something happened in their town. A Black man was shot by the police. "Why did the police shoot that man?" "Can police go to jail?" Layla, the new girl in first grade, is hesitant to participate in school-day activities because she is afraid that her head scarf makes her look too different from her classmates. But as the day progresses, and the curious first graders learn more about Layla's culture, they help to make her feel more comfortable in her new school. What if there were no prisons? Alternative approaches to dealing with crime are underway around the world to explore how victims, offenders, and communities can heal rifts and repair damage. It's often called restorative justice. It's a way to think about the deeper reasons behind crimes, and suggests that by building more caring communities, it's possible to change our societiesand ourselves. The Wedding Portrait is an essential book for kids about standing up for what's right. Here are stories of direct action from around the world that are bookended by the author's wedding story. He and his bride led their wedding party to a protest, and were captured in a photo by the local newspaper kissing in front of a line of police just before being arrested. Two poets, one white and one black, explore race and childhood in this must-have collection tailored to provoke thought and conversation. Self-Care for Kids This is not your usual kid's book This book is a call to BE, to step forward and LOVE yourself, LOVE your community, know your history and your powerful place in it and strengthen your own creative power This book is a tool to use. I created it because I know you are an important part of our world and your strength matters.